Roland Kathaus, professore alla University of East London, è visiting professor presso il Dipartimento di culture del progetto dal 1 al 26 aprile, con un corso di 2 CFU aperto a tutti gli studenti delle magistrali e una lezione al dottorato in urbanistica. The course will seek to investigate the phenomenon of negotiated space, through seminars and field study work; photography and sketching; and will culminate in a single drawing at a large scale. The opening seminar will explore some historic and contemporary case-studies of negotiated spaces in London, to demonstrate how the process shapes the structure of this unique city. 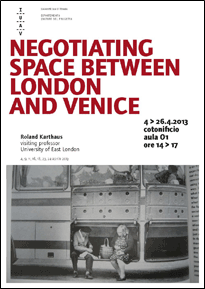 Along with other case-studies, the example of London will cast a new light on the spaces of Venice and we will attempt to expose similarities between these two apparently contrasting cities. Through the identification of the tactics of negotiation in specific spaces in Venice, the drawings created during the course will begin to formulate a representational taxonomy of negotiated spaces. Each student’s final drawing will be the result of a process of: inquisitive observation; analysis; assimilation; collage (literal and metaphorical and using both Computer Aided and hand-drawing techniques); and finally thorough editing. Only that which is worthy of representation should remain.